Is A Little Bit Of Radiation Good For You? When a political commentator like Ann Couler weighed in on FoxNews about the radiation hazard posed by nuclear power plants damaged by a severe earthquake and tsunami in Japan, you can be sure there will be questions over what motivated her to speak out on this topic. According to Coulter, a little bit of radiation is good for you. The timing of this pronouncement appears to be particularly insensitive to Japan where food is contaminated and there is direct radiation exposure to people in the immediate area of damaged nuclear power plants. Did the nuclear power industry somehow influence Ann Coulter to spread disinformation that would be a partial cover for their culpability in the recent leak of radiation in Japan? Hardly. In the aftermath of the earthquake/tsunami in Japan, a global map which erroneously showed lethal doses of radiation could be carried in the atmosphere to North America spread via the internet, spread fear throughout North America. The demand for the antidote to radiation-induced thyroid cancers, potassium iodide pills, far exceeded the supply. The U.S. would receive a dose of radiation less than a CT scan, but the American population was edgy. Could health authorities be trusted? The nuclear accidents at 3-Mile Island and Chernobyl, as well as the two atom bombs dropped over Hiroshima and Nagasaki in WWII did not produce mass death. Contaminated milk in Chernobyl, given to young children, resulted in a few thousand thyroid cancer deaths in subsequent years, a threat that could have been totally avoided had precautions been practiced. But back to Ann Coulter’s assertion that a little bit of radiation is good for you – true or false? The mantra coming from public health agencies is that any radiation increases your risk for cancer. But the hard data defies that notion. Health threats posed by radon gas: real or imagined? In the U.S., the Environmental Protection Agency (EPA) warns of the theoretical radiation threat posed by radon gas. But mountainous areas where clefts in the earths’ crust increase the escape of radon gas have much lower rates of cancer. The EPA has made an industry out of this false health threat – homes must now be cleared of a radon gas hazard before they are sold. B.L. Cohen of the University of Pittsburgh says that despite extensive investigation, the idea that inhalation of low-dose radon products poses a cancer risk appears to be without solid scientific substantiation. While the EPA continues to warn the public of the potential dangers posed by radon gas, in fact, low-dose radiation appears to be beneficial to human health, stimulating the immune system. The problem with the EPA’s radon gas mortality numbers is that they aren’t a count of dead bodies, they are mathematical extrapolations. If X number of people die from exposure to high-dose radiation, then how many would die from chronic exposure to low-dose radiation? The assumption is that low-dose radiation would pose an accumulated risk. Oddly, higher levels of lung disorders have never been reported among pets living in homes where radon levels are high. What about nuclear radiation exposure? Health authorities in the U.S. do not recognize the idea of radiation hormesis – a biological threat that could be mortal in high dose but actually beneficial, activating defense mechanisms in the human body, at low dose. You can see for yourself, in the chart below, that tumor incidence actually declines in the low dosage range for gamma radiation exposure. 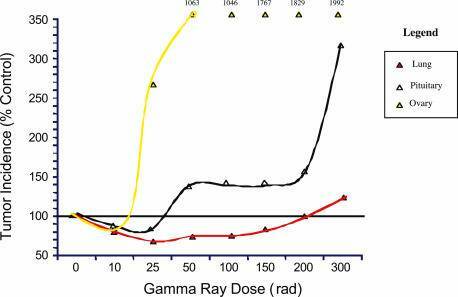 In a controlled experiment, intermittent low-dose exposure to gamma radiation to rodents actually slowed the growth of existing tumors and raised the activity of glutathione (glu-tah-thigh-on), a major antioxidant. Studies, conducted in the early 1990s (in Japan, of all places), suggest low-dose total body radiation should actually be considered for cancer therapy. T. D. Luckey, in his report entitled “Radiation Hormesis: The Good, The Bad, And The Ugly,” says the “ugly” is “the misguided conclusion about low dose radiation by authorities who advise the U.S. government. Luckey documents over 3,000 scientific research papers which show that low dose irradiation is stimulatory and/or beneficial in a wide variety of microbes, plants, invertebrates, and vertebrates. Based upon the mass demand for potassium iodide pills in the U.S. during the recent posed nuclear radiation threat, one has to believe Americans were intentionally induced into fear over the proposed health threat that was thousands of miles away. The erroneous map showing lethal effects in the U.S. from nuclear radiation leakage in Japan carried the logo of a government agency that never issued a denial of its origin. Ironically, one of the leading advocates of this low-dose radiation for health idea is Dr. Sadao Hattori, who has been conducting research sponsored by the Central Research Institute of the Electric Power Industries in Tokyo. Of course, the nuclear power companies could use this evidence as a partial cover for their irresponsibility in not maintaining adequate safety measures and in not demolishing old nuclear power plants which do not have modern safety features, which was the case in Japan. But the facts remain, a small bit of radiation is beneficial to human health. Why would U.S. health authorities suppress these discoveries? Why would U.S. health agencies foment undue fear of low-dose radiation? There are those who conclude that public health authorities are involved in a form of covert population control. What other conclusion is there? Any non-invasive therapy that would save over 275,000 lives a year has to be debated in a serious court of medical opinion. The consensus among radiation biologists is that low-dose radiation is beneficial, but among public health agencies, any dose of radiation increases the risk for cancer. The public should be warned to ignore pronouncements by public health agencies of health threats posed by radiation. Radiation appears to be essential for life. If you can overcome your ingrained fear, you might be won over to this idea yourself. An afterthought is that the replacement of uranium with thorium-based reactors would virtually eliminate the health hazards posed by all operating 442 nuclear power plants in the world today. – © 2011 Bill Sardi, Knowledge of Health, Inc. Free to use for personal health, not for commercial gain. Not for posting on other websites. My son used to send me your emails before you retired, It was a sad day when I heard you were retiring and writing your last news letter.I hope you are enjoying your retirement as I am.And I’m looking forward to more of your email. Remember a great saying that goes, I want to die as young as I can as late in life as possible. Take care Bill and god bless you.